October is Breast Cancer Awareness month. Over at the Diva's challenge, Laura is honoring her Grandmother who had breast cancer. The challenge is to use pink to honor someone you know that has/had breast cancer. 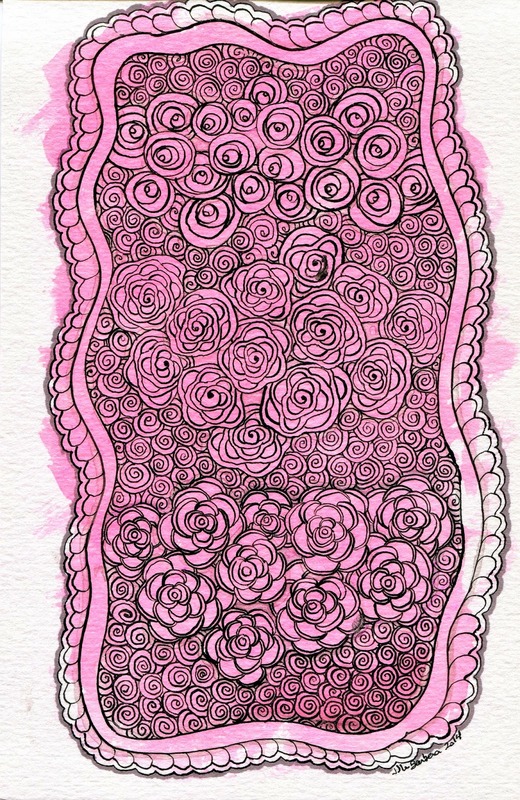 I did zentangle inspired art to honor Laura's Grandmother, my Godmother, and my friend who all battled breast cancer and for my Aunt who had cancer but is luckily now cancer free. While it didn't scan really well, the pink here has a little shimmer to it. I started by watercoloring the background and using a dip pen and india ink, drew my garden over the top. I used variations of Diva's Dance and Arc flower and the top flower is inspired by Charles Rennie Mackintosh. I think that someone has already done a step out for a pattern like it but I am not sure. I was going to shade with my prismacolor markers here but the paint really stopped that from happening. I'm not sure why, maybe the paint and the alcohol? but as I started, the marker picked up the pink as I went and was not doing nice things. So, I stopped and made a light wash with the india ink and used a small brush to shade. The outside shading is the marker. I like the whimsy of the piece and even the pink (a color that I don't usually embrace). This is also doing double duty for my inktober drawing for today. Not too bad for a morning's work. Thanks for stopping by and for all the wonderful comments each week. I appreciate them all, I just don't usually have time to go back and comment to everyone individually. Have a wonderful week! Great one, love those flowers! Wow, what a lovely monotangle!!! Beautiful Challenge Tile, JJ. Love your patterns. I appreciate your technique description in your pose. Great color of Pink.